Tim Hortons rolls out their 2017 holiday menu and cups to locations nationwide and are also offering a limited number of free knit Ugly Sweater Koozies with any latte purchase at select locations, while supplies last. - Holiday Sugar Cookies in gingerbread and snowman designs to match the chain's holiday cups. - Gingerbread Donuts and Timbits donut holes. The Ugly Sweat Koozies can only be found at select locations in Detroit, MI, Columbus, OH, and Buffalo, NY, while supplies last. 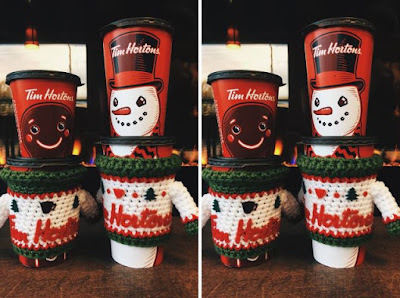 Tims Hortons holiday menu items and themed cups will be available throughout the holiday season, while supplies last.